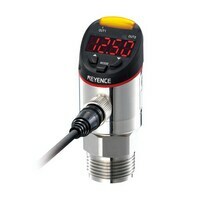 Heavy Duty Type Digital Pressure Sensors GP-M series Oil, Water, even MISTY AIR A wide variety of applications can be realised with this sensor alone. 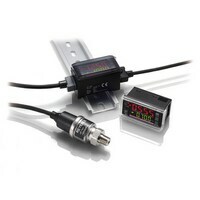 Ultra-compact Digital Pressure Sensor AP-C30 series New AP-C30W series digital air pressure sensor with unique 2-colour digital display replaces conventional mechanical gauges. 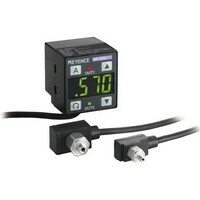 Durable Multi-Fluid Digital Pressure Sensors AP-V80 series KEYENCE's AP-V80 series pressure sensor head, designed with single body stainless steel construction, are durable and capability of detecting fluids such as oil, water and air mist. 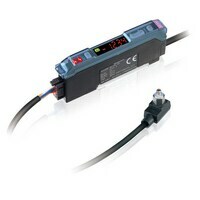 Digital Pressure Sensor with 2-Colour Display AP-C40 series New AP-C40K series digital air pressure sensor with the industries first wire-saving design system. 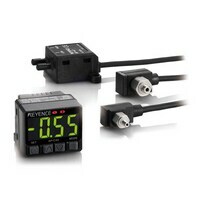 Wire-saving AI Digital Pressure Sensor AP-V40 series New AP-V40 series digital air pressure sensor with the industries first wire-saving design system. Separate Amplifier Type Pressure Sensor AP-40 series The industry's smallest and lightest air pressure sensor head, weighing only 7g. 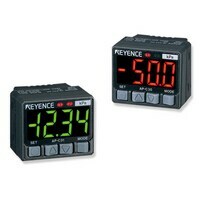 The super-small sensor head can be mounted close to the detection point decreasing response time. 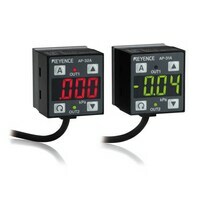 Two-colour Digital Display Pressure Sensor AP-30 series AP-30 series digital air pressure sensor with unique 2-colour digital display replaces conventional mechanical gauges.